Aroma Therapeutics Bath & Body, sniff and you’ll miss it. You would be forgiven for not having heard of Aroma Therapeutics before… I stumbled across them when I was at The Vitality Show last month. They were doing an offer on their bath and body oils and being the sucker oil lover that I am, I couldn’t resist parting with my pennies for a few. In the bottle, they smell incredible. Easily as good as offerings from the more well-known brands such as Aromatherapy Associates, Tisserand and NEOM… but sadly, this is pretty much where the similarities end. Once dispensed into water… the scent dissipates far too quickly, we’re talking gone in a matter of 30 seconds. Frankly, a fart would linger for longer. I’m guessing that although exquisitely blended… there just isn’t enough of the potent stuff in these bottles to carry the aroma for a decent length of time. I’ve also tried applying to my skin before jumping in the shower… but again, as soon as the water hits it, sayonara good stuff. It truly is a bit of a tragedy because the Recharger scent (Rosemary, Ginger, Rosewood, Nutmeg and Orange) in particular is divine. I haven’t tried any of the other products in the same scent lineup which includes massage oils and spray concentrates, perhaps I should limit the use of these purely on my skin rather than as part of my bathing routine but damn it, I bought these as bath treats! 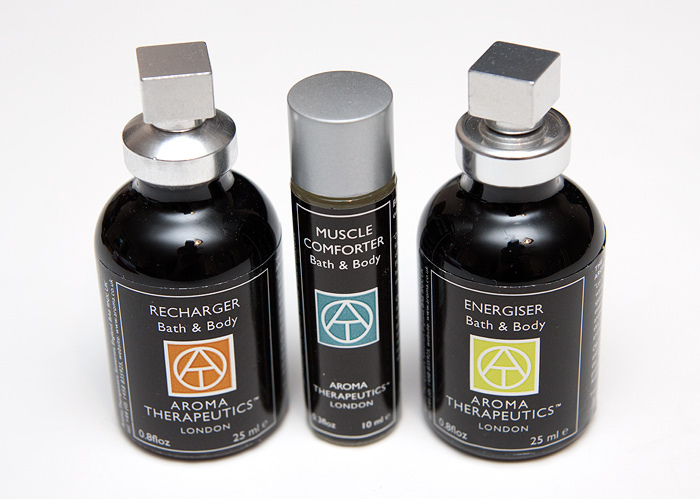 Aroma Therapeutics are available to buy online from Fragrant Earth and are currently on BOGOF and are £26.65 for 50ml. What are your favourite bath-time treats?